Run, walk or jog through our beautiful town along the extensive trail system offered. 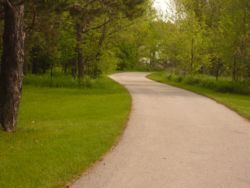 This trail system runs by neighborhoods, parks, ponds and more for a pleasant atmosphere while you exercise or stroll. The trails will keep you moving through town for miles, many places without even crossing streets to slow you down. The Gay Lea Wilson Trail leads to Pleasant Hill creating even more areas to explore and move through! Overall, the trail system in Altoona is a unique offering for the city and in my opinion a luxury. Take advantage of this carefree way to get move through our beautiful city.